• Purchases of new U.S. homes in September stayed close to an almost nine-year high, showing residential real estate was maintaining momentum heading into the quieter selling season. • Sales climbed 3.1 percent to an annualized rate of 593,000 from an August pace that was weaker than initially reported, Commerce Department data showed Wednesday. The median forecast in a Bloomberg survey called for 600,000 pace in September. Purchases in June and July were revised lower. • Estimates ranged from 518,000 to 662,000. The Commerce Department revised the August reading down to a 575,000 pace from a previously estimated 609,000. July was revised to a 629,000 rate, still leaving it at the fastest since November 2007. • The revisions over the previous three months underscore the data’s volatility, one reason economists prefer to look at longer term trends. The report said there was 90 percent confidence the change in sales last month ranged from a 13.1 percent drop to a 19.3 percent increase. • The residential real estate market still is supported by job-market improvement and cheap mortgage rates. The average 30-year fixed-rate mortgage was 3.52 percent in the week ended Oct. 20, holding near the record-low 3.31 percent reached four years ago, according to Freddie Mac figures dating to 1971. Median spending on utilities is $2,715 per year – or $226 per month – for single-family homes, according to a new analysis from real estate website Trulia. Even when you're comparing homes of similar sizes and prices in the same region, it found, energy costs can vary widely based on factors like the local utility providers' rates, the age of your home and the size of the lot it sits on. "If you're moving to a single-family home for the first time, or moving to a new area in general, this is definitely something you should be paying attention to," said Felipe Chacon, a housing data analyst at Trulia. For example, homes in Three Points, Arizona, have utility costs 2.5 times as high as those in nearby Avra Valley, Arizona — $620 per month versus $240 — despite the two Tucson suburbs having homes comparable in square footage and value. Much of the difference stems from larger lots in Three Points, said Chacon, which can trigger bigger water bills for maintaining the landscaping. To avoid a surprise, ask about utilities during your hunt. Real estate listings often include estimates, but it's smart to ask for a copy of recent statements to see real numbers, said Cathy Seeber, a certified financial planner and partner at Wescott Financial Advisory Group in Philadelphia. "Most give you annual information, so you can see what the historical bills have been," she said. Don't assume high figures can be solved by say, making home improvements to boost energy efficiency, said Chacon. Look to see how the utility divides the bill — some have a high fixed charge for providing service and lower rates based on usage, limiting your ability to save. Smaller utility companies also often have higher rates because they don't have the same economies of scale that big utilities do, he said. While you're at it, consider costs and coverage options for other home services like internet, cable or satellite TV, said Seeber — who has seen clients buy a home only to sell it quickly because they couldn't get decent cellphone reception or high-speed internet. Sites like Allconnect.com can help you find providers by address and ZIP code, while Opensignal.com maps wireless coverage. When in doubt, said Seeber, ask the neighbors how they've fared. If you find utility costs to be bigger than expected in a new place, conduct a home energy audit to locate the trouble spots. The Department of Energy offers guidelines to do the assessment on your own; many state agencies and utilities also offer free or low-cost professional audits. Some improvements quickly pay for themselves. Sealing air leaks and weather-stripping windows could cut bills by as much as $166 and $83 per year, respectively, according to government estimates, while insulating your water heater tank could save another $45. Demand for single-family housing reached its highest level since June 2013, having picked up momentum after Labor Day, according to Redfin’s Housing Demand Index for September 2016. According to Redfin, buyer demand rose by 13.3 percent over-the-month in September up to a level of 105, its highest level in three-plus years, after nearly 32 percent more potential buyers toured homes and nearly 27 percent more potential buyers made offers. A reading of higher than 100 for the Redfin Housing Demand Index indicates stronger or higher-than-expected demand, while a reading of lower than 100 indicates weak demand. For September 2015, the reading was 101. 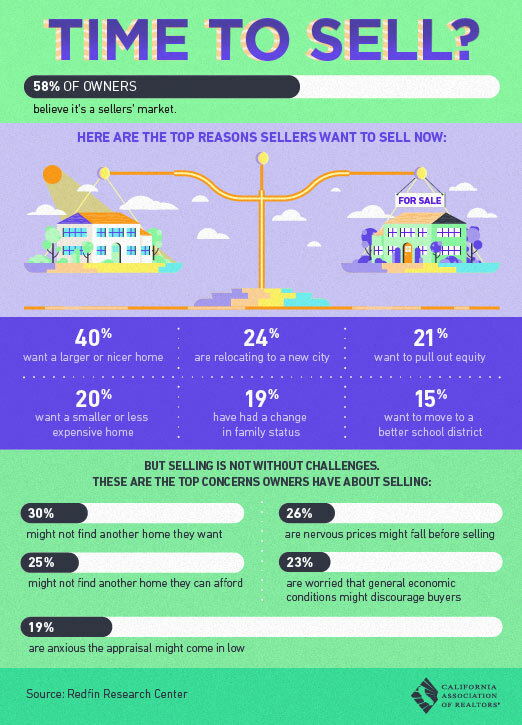 This data indicates that there is a healthy pool of buyers ready and willing to purchase a home as long as they find the right one, according to Redfin. Despite the new listings that hit the market after Labor Day, Redfin agents still reported a need for more inventory in what has turned out to be a lengthy housing supply shortage. The National Association of Realtors (NAR) reported that in September, there were 2.19 existing homes for sale, which was 6.8 percent lower than September 2015’s inventory despite a slight monthly increase. LOS ANGELES (Oct. 24) – California pending home sales improved from the previous month and year, however, overall market conditions appear to be slowing down and closed transactions plateauing, the CALIFORNIA ASSOCIATION OF REALTORS® (C.A.R.) said today. Cooling market conditions were reflected in C.A.R.’s September Market Pulse Survey,** with most leading indicators showing a decline in growth and REALTORS® becoming less optimistic about market expectations and more concerned with lower housing affordability. • Statewide pending home sales increased in September on a seasonally adjusted basis, with the Pending Home Sales Index (PHSI)* rising 5.3 percent from 121.3 in August to 127.7 in September, based on signed contracts. On an annual basis, California pending home sales were up 10.5 percent from the September 2015 index of 115.5 – the sixth consecutive year-to-year increase. • At the regional level, for Southern California as a whole, pending sales dropped 4.6 percent on a monthly basis, the third month-to-month decline. On an annual basis, pending sales were up 15.3 percent in the region. Los Angeles, Orange, and San Diego counties posted healthy year-over-year increases of 15.9 percent, 13.3 percent, and 15.7 percent, respectively. • For the Bay Area as a whole, pending sales were 2 percent higher than August and 8.6 percent higher than September 2015, driven by strong year-over-year pending sales gains of 20.2 percent in San Mateo County and 24.2 percent in Santa Clara County. In San Francisco County, pending sales inched up 1.9 percent. • Overall pending sales in the Central Valley posted a 5 percent monthly increase and a 7.5 percent annual gain. One exception for the region was Kern County, where pending sales declined 4.5 percent from a year ago, due to a decline in oil prices and the economy’s reliance on the energy sector. • Privately-owned housing starts in August were at a seasonally adjusted annual rate of 1,142,000, according to a report released by the U.S. Census Bureau and the U.S. Department of Housing and Urban Development. This is 5.8 percent below the revised July estimate of 1,212,000, but is 0.9 percent above the August 2015 rate of 1,132,000. • Small, mortgage applications ticked up 2.9 percent from one week earlier, according the Mortgage Bankers Association’s latest Weekly Mortgage Applications Survey for the week ending Sept. 30. • The refinance share of mortgage activity edged up to 63.8 percent of total applications, increasing from 62.7 percent the previous week. 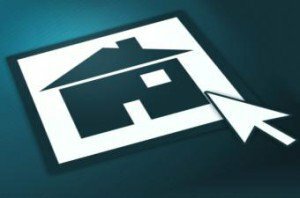 The adjustable-rate mortgage share of activity increased to 4.5 percent of total applications. • The average contract interest rate for 30-year fixed-rate mortgages with conforming loan balances ($417,000 or less) decreased from 3.66 percent to 3.62 percent, marking the lowest level since July 2016. • The average contract interest rate for 30-year fixed-rate mortgages with jumbo loan balances (greater than $417,000) decreased to 3.6 percent from 3.64 percent. The summer housing market saw high demand next to rising home prices, but don’t expect Fall to bring any relief. In fact, it could bring the hottest fall in a decade, new data from realtor.com shows. In August, Lawrence Yun, the National Association of Realtors Chief Economist, said that without new housing construction, the housing recovery could stall. Housing inventory declined annually for 15 consecutive months, and properties closed 11 days quicker than August last year, according to the Pending Home sales report by NAR. Inventory also remains down as less than 450,000 new listings came on the market in September, while the median home price rose 9% from last year to $250,000, a new high for the month. California once drew legions of fortune seekers to its short-lived Gold Rush. Although few newcomers are likely to strike gold in the literal sense today, the Golden State continues to charm big dreamers — not just aspiring actors and tech-preneurs, either. California’s many other riches are a magnet for families in search of opportunity. There’s no shortage of economic activity in the state, for one. California’s GDP of $2.5 trillion in 2015 exceeded those of all but five countries. That’s due in part to its way of setting kids up for success, by establishing some of the best universities in the world. And once employed, workers benefit from a comprehensive paid family-leave program. California was the first state to offer that incentive to American families and remains one of only a handful of states to implement such a policy. Add to that list of priorities an abundance of fun and entertainment options, including Disneyland and Universal Studios. For outdoor-loving families, the state teems with natural beauty, providing plenty of opportunities to explore. Such a combination of qualities makes California the ideal place for parents to raise their children. But it’s not all moonlight and roses throughout the state — some cities are more family-friendly than others. WalletHub’s analysts therefore compared 240 Golden State cities to determine which among them is most conducive to family life. In making such a comparison, we examined each city across 21 key metrics, ranging from “number of attractions” to “number of pediatricians per capita” to “unemployment rate.” Scroll down for the winners, additional expert commentary and a full description of our methodology. Following a dip in home sales in 2016, California’s housing market will post a nominal increase in 2017, as supply shortages and affordability constraints hamper market activity, according to the “2017 California Housing Market Forecast,” released last week by the CALIFORNIA ASSOCIATION OF REALTORS® (C.A.R.). • The C.A.R. forecast sees a modest increase in existing home sales of 1.4 percent next year to reach 413,000 units, up slightly from the projected 2016 sales figure of 407,300 homes sold. Sales in 2016 also will be virtually flat at 407,300 existing, single-family home sales, compared with the 408,800 pace of homes sold in 2015. • The California median home price is forecast to increase 4.3 percent to $525,600 in 2017, following a projected 6.2 percent increase in 2016 to $503,900, representing the slowest rate of price appreciation in six years. • 30% of Americans say now is a good time to purchase a home, a drop of 3 percentage points from the previous month and now at an all-time survey low.• 15% of Americans say now is a good time to sell a home, now at an all-time survey high.• More consumers think home prices will rise over the next 12 months compared to March, and slightly fewer consumers also expect mortgage rates to go up over the next year.• The percentage of respondents who say they are not concerned with losing their job increased 6 percentage points to 74%, nearly a 7 percentage point decrease in March.• The percentage of respondents who say their household income is significantly higher than it was 12 months ago held at 11%. FIRST-TIME HOMEBUYERS WANT TO SKIP "STARTER HOME"
WHY AREN'T NEW HOMES GOING UP THAT MILLENNIALS CAN AFFORD? All across the country, home prices are shooting up, driving buyers to slug it out in bloody bidding wars. And those feeling the punches the hardest: first-time home buyers. Cut me, Mick! One of the main factors pushing up prices also happens to be one of the most intractable: There just aren’t enough newly constructed homes that are affordable for sale. Yet home builders, who could swoop in heroically and save cash-strapped millennials by creating a new wave of entry-level homes, aren’t coming to the rescue any time soon. Much like home buyers themselves, builders are still struggling to recover from the housing crash of ’08—dealing with lenders who don’t want to lend and higher costs for all things housing-related. Construction on single-family homes is expected to be up about 15% this year over the previous one, says Robert Dietz, chief economist at the National Association of Home Builders. About 647,900 new, single-family homes were completed in 2015, according to the U.S. Department of Commerce. But don’t expect to score a bargain-basement deal on a brand-new starter home. Not anytime soon, anyway. That rose-colored American dream of moving into a gleaming new first home made just for you—well, it’s fast fading into scratchy black and white. “Builders are creating larger, more expensive homes for older buyers” with the money to burn, Dietz says. Sorry, millennials! Those target older buyers are typically existing homeowners who want to move up into bigger homes. So first-time buyers are caught in a classic bind. They don’t make up a significant share of the new-home market—only 11% of those 35 and under bought new, never-occupied homes, according to a recent National Association of Realtors® report. They’re just too darn expensive, and so not many new homes are being built for them. Can anyone say “chicken vs. egg”? For example, the median price of a new home was $301,400 in February, according to the U.S. Department of Commerce. That’s a big contrast from the median cost of an existing home at $210,800 in February, according to NAR. The reason that new construction is more expensive isn’t just because you’re getting shiny new appliances and rooms that have never been lived in before. It’s everything that goes into developing a brand-new residential area. “In some large metro areas like New York and San Francisco … it’s difficult to obtain land to build on,” Dietz says. Builders in most markets must contend with zoning, securing permits, and taking care of any environmental issues, as well as installing the infrastructure on newer developments, including sewers and roads, he says. And the longer it takes to prep the land and put up the houses, the more costly it is for builders—and therefore for buyers, too. “If you buy the land, and it takes you 10 months instead of two months to get all the permits and agreements from utilities … [that] raises the cost for the builder and reduces the number of potential buyers willing to wait around a while until they can move in,” says Ken Simonson, chief economist for the Associated General Contractors of America. There are more cost-effective ways to build. By fitting more residences such as townhouses into smaller lots in new developments, builders can charge less per home. Residences are generally cheaper to build—and therefore cheaper to buy—farther from city centers. But many people want to avoid long commutes to work, says Susan Wachter, a real estate and finance professor at the Wharton School of the University of Pennsylvania. So those homes may end up being a harder sell. The burst of the housing bubble in 2008 was catastrophic for the residential construction industry—about half of builders went out of business as buyers and financing dried up. Laborers who got laid off went on to other industries or careers. Some builders are now just beginning to get back into the market. But even when they do, they often can’t find the skilled workers essential to constructing homes—the industry remains down about 900,000 laborers, says NAHB’s Dietz. In addition, some contractors were burned during the financial crisis by builders who, once their own businesses began to suffer, stiffed contractors on their fees or paid them less than promised for labor, says Jonathan Smoke, chief economist of realtor.com. Those enterprising contractors who stayed afloat by moving into home remodeling or commercial construction may be understandably reluctant to go back into business with the same builders who are now knocking on their doors. It isn’t just hopeful home buyers who have to run the gantlet with newly strict lenders to get the necessary cash for a new home. The bulk of residential construction around the country is done by smaller builders who typically go to local lenders such as banks and credit unions for financing. But after the crisis, lenders became way more cautious about doling out loans. This means developers and builders have a harder time getting the financing needed to embark on new projects and that limits the amount of new construction. “There are limits to how fast the industry can grow, given the industry has to rebuild its workforce, rebuild the building lots supply, and also have an increased access to lending for builder loans,” Dietz says. But first-time buyers shouldn’t necessarily despair. There is hope! Given the raw numbers of younger home buyers entering the market, it’s likely that builders will wake up to the opportunities they represent and start addressing it head-on. Eventually. Home designers can look at cheaper materials or construction to put up a quality home for less, says residential building consultant Tony Callahan, president of Kennesaw, GA–based Callahan Consulting Group. For example, instead of installing a wooden banister along a staircase, a half-wall could go up instead, he says. Formica countertops in kitchens can be used instead of granite just as linoleum, instead of tile, can be laid down in the bathrooms. And not every room needs several windows. “It’s really looking at all parts of the home,” Callahan says. Smoke has also begun to see some of the bigger builders such as D.R. Horton put up more attractively priced dwellings. “But it’s just not enough,” he says. The country is losing more affordable homes each year and very few similarly low-priced residences are going up to replace them, Smoke warns. Some are lost through simple wear and tear over time, others succumb to environmental disasters (such as storms) or are torn down so that bigger ones can go up in their stead, Smoke says. Investors have also swooped in in recent years and turned many of these less expensive abodes into rentals. “You can’t have an increase in first-time buyers if the first-time buyers don’t have homes to purchase,” he says. More than a quarter of all U.S. homeowners are planning to improve or renovate their houses in the next year, according to a new report from Bankrate. Bankrate said even lower-income homeowners are planning to renovate, using savings, credit cards or bank loans. Some people might just be sprucing up their houses to sell them. But there are lots of big projects planned — stuff you do when you want to stay in a house. “Kitchen remodeling or even making an addition to the house – people don’t tend to do those large projects and then move right away,” said Mike Cetera, Bankrate’s personal loans and credit analyst. Why are they staying put? “I think this is a flag of surrender,” said Anthony Sanders, distinguished professor of finance at George Mason University. Sanders said after the housing crisis, people gave up on the idea of buying a big, fancy house. Sanders said the average U.S. household is poorer now than it was before the crisis, and housing prices have risen out of reach.More than a quarter of all U.S. homeowners are planning to improve or renovate their houses in the next year, according to a new report from Bankrate. Sanders said the average U.S. household is poorer now than it was before the crisis, and housing prices have risen out of reach. Last year, many real-estate experts predicted that foreign investors could flock to U.S. real estate as a safe haven amid global economic tumult. Last June, Realtors reported that Chinese buyers had surpassed Canadians as the top foreign buyers of U.S. real-estate, saying this reflected growing interest in the U.S. as a secure place to park their money. In fact, there is growing evidence that many foreign buyers have been pulling back, in part because prices in many of the cities they favor, such as New York and San Francisco, have risen sharply. The affordability of those properties is weakened further by a stronger U.S. dollar. In January, the median price of existing U.S. homes had increased 67% for a buyer from Brazil, factoring in the exchange rate, compared with a year earlier, according to NAR. For a buyer from Canada, it increased 27% and for a Chinese buyer, 14%. China is also cracking down on buyers who try to evade a $50,000 annual limit on how much money they can transfer out of the country. Chinese buyers often skirted this requirement by transferring money via friends, family member or employees. In January, the country began more closely monitoring such transfers, NAR said. Lawrence Yun, NAR’s chief economist, said it is unclear whether Chinese demand for U.S. homes will fall as much as demand from other countries. Chinese economic growth may have slowed, but the country is still reporting growth of more than 6%. And while many Chinese residents have lost money in the stock market, giving them less to spend, that could also prompt them to try to diversify their investments. Foreign demand is difficult to quantify. NAR does so through a survey of real-estate agents it conducts annually, looking at the period from April through March. The results of this year’s survey are expected to be released in the early summer. Mr. Yun said he expects to see a decline in demand. 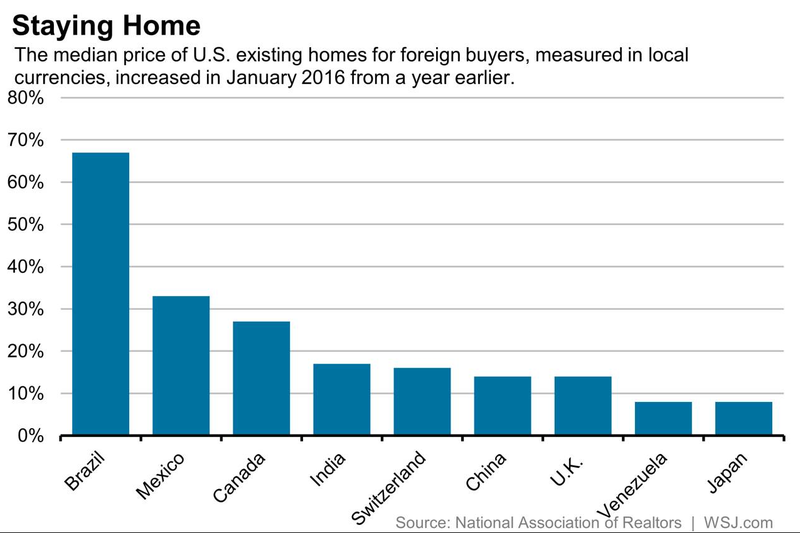 Foreign buyers remain a small sliver of the U.S. housing market. But any pullback could have a disproportionate effect on demand for high-end condos in places like Miami and Manhattan and luxury homes in Southern California. There could be a silver lining, however: Falling foreign demand could help make homes more affordable for U.S. buyers. “Given that the U.S. currently has a housing shortage, any demand pullback helps,” Mr. Yun said. • According to the February Mortgage Bankers Association Builder Application Survey, new homepurchases surged 24 percent in February, kicking off the spring buying season. levels are not too different from the month prior. • The average loan size of new homes increased from $325,806 in January to $328,370 inFebruary. What’s a millennial pushing 30 to do? Apparently, leave the fun, the fantasy, the pace, and the possibilities of big-city living far behind and buy a home … out in the burbs. Just 17% of buyers under the age of 35 closed on urban residences, down from 21% a year earlier, according to a recent National Association of Realtors® report on generational trends in home buying and selling. The report looks at housing data from July 2014 through June 2015 and income data from the end of 2014. The luster of urban life may be fading—for some, anyway—due to skyscraper-high prices in top markets. Suburbs exerted a strong pull on buyers of all age ranges. About 51% of millennial home buyers scooped up residences in the suburbs or a subdivision compared with 58% of Generation Xers (ages 36 to 50); 51% of baby boomers ages 51 to 60; 53% of boomers ages 61 to 69; and 42% of the Silent Generation (70 and older). Millennials make up the largest share of home buyers at 35%, according to the report. That should come as no surprise, given the unprecedented size of their generation (83 million) and the life changes that are motivations for buying a home (nearly two-thirds of millennial buyers are married, while almost half have children living with them—and are therefore probably desperate for more space). But the most challenging obstacle for aspiring home buyers of any generation—beyond finding their own personal palaces, securing a mortgage, and wading through reams of paperwork—is cobbling together the dreaded down payment. “It’s often the largest financial challenge to a first-time home buyer to come up with all the funds that are necessary,” Smoke says. But that family help might not be what it once was, says Donna Butts, executive director of Generations United, a Washington, DC–based group that advocates for intergenerational policies and practices at the national level. Parents these days may be tapped out from financing their children’s college tuition—as well as trying to help them pay down their student loan debt. And these kinds of bills may lead more young people to live with their families longer as they save up for a home of their own, she says. They also may be more than just a little leery of plunking down such a huge chunk of change after living through the Great Recession and some turbulent stock markets, saysJason Dorsey. He’s the chief strategy officer at the Center for Generational Kinetics, a millennial research and marketing firm based in Austin, TX. However, it’s not just millennials struggling to save up that 20% down. About 44% of Generation Xers and 36% of boomers 60 and below who said that saving up for a down payment was the most difficult part of the home-buying process blamed being saddled with credit card debt, according to the report. Another issue for those of any generation seeking to move into their own homes: how much they’re paying out each month in rent—which doesn’t leave too much left over to go into the trusty savings account, realtor.com’s Smoke says. Why move to the suburbs? There also just simply aren’t enough homes on the market that the average buyer can actually afford, particularly in high-priced urban centers, Smoke says. But cheaper prices at the pump make it less expensive for drivers from the burbs to commute to work in the city. And those communities, known for their strip malls and manicured lawns, are also becoming, well, more urban. As more former urban dwellers move in, more cafes, trendy boutiques, and Whole Foods stores are going up. And the Main Streets are becoming more walkable. Who’s buying the biggest homes? Once they get to those suburbs, Generation Xers are the most likely to want to trade up to larger residences as their families expand. 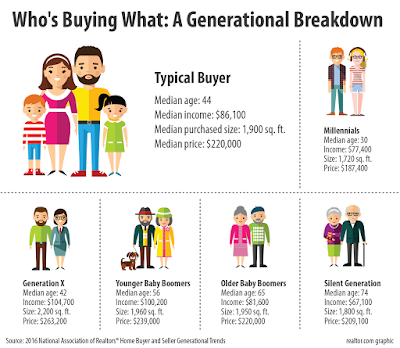 Despite Gen Xers often bringing home more bacon than they did when they were just starting out, it can be just as hard for them to come up with the pan to fry it in—or rather the down payment needed to score a larger home, says Smoke. That’s because the housing market is just starting to recover, so they haven’t been rewarded with the big price bumps or have the home equity that would provide them the extra cash needed for that down payment. “They are most likely to have children, and they’re increasingly starting to think about the potential of having their [elderly] parents move in with them,” he says. Gen Xers snapped up the largest homes, at 2,200-square foot, for about $263,200, according to the report. Meanwhile millennials typically bought 1,720-square-foot residences for $187,400. Boomers ages 51 to 60 scooped up 1,960-square-foot houses for $239,000, while boomers ages 61 to 69 purchased 1,950-square-foot houses for $220,000. Members of the Silent Generation typically bought smaller, 1,800-square-foot homes for $209,100.